Originally founded as the western terminus for the Chesapeake and Ohio railroad, Huntington has developed into a thriving cultural and commercial center for the Ashland-Huntington areas of Kentucky, Ohio and West Virginia. The “Jewel City” has a population of just under 50,000 but the downtown area bustles with many more visitors from the surrounding counties. 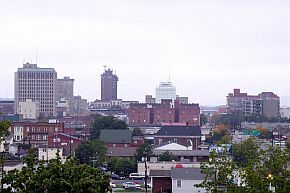 Huntington is a center for healthcare in the region with several medical centers, the Marshall School of Medicine and a regional Veteran’s Administration hospital. In addition, it is home to the state’s largest psychiatric institution, the Mildred Mitchell-Bateman Hospital. Huntington has also developed a significant presence in the banking and whole sale food sectors and there are still some heavy industrial plants located in the city. Notable companies with a large presence in the city are Heiner’s Bakery, the maker of Sara Lee products and West Virginia Steel. The downtown area is a mixture of historical buildings from the mid 19th century and modern office buildings. There are several museums, numerous art galleries and a wide variety of dining and entertainment venues. Life is generally quiet in this relatively small city but there are tremendous opportunities for those who cherish this lifestyle.